Polls show Americans overwhelmingly oppose US action in Syria, 62-24. Having backed himself into a tight corner by proclaiming a “red line” over Syria’s use of chemical weapons, President Obama may have really trapped himself. At the risk of mixing my metaphors, he’s slip-sliding toward war in Syria. The only bright spot is that he hasn’t given up on diplomacy, and he seems to realize that involving Russia is critical to finding a political resolution to the crisis. 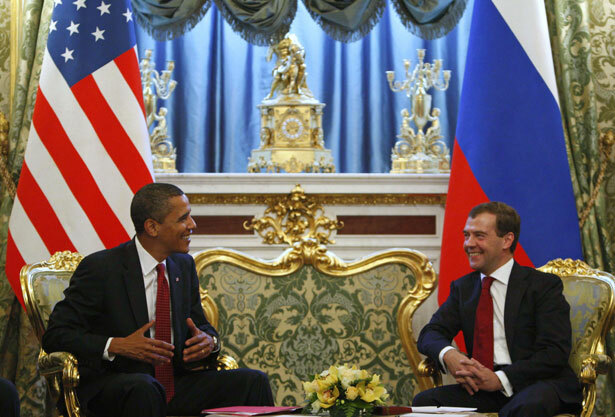 On Monday, Obama spoke with President Vladimir Putin of Russia, and he’s sending Secretary of State John Kerry to Moscow. Obama should take a long look at a New York Times/CBS poll that reveals that despite right-wing warmongering on Syria, the American public is overwhelmingly opposed to American involvement there. According to the poll, Americans oppose involvement by a margin of 62 to 24 percent. But Obama, who spoke by telephone with Putin on Monday and is sending Secretary of State John F. Kerry to Moscow in the coming days, is likely to make a final decision on the supply of arms to the opposition within weeks, before a scheduled meeting with Putin in June, the officials said. In his news conference yesterday, Obama didn’t say anything about the decision to arm the rebels, many of whom have close ties to Al Qaeda and other extremist groups, but with the shameful failure of intelligence about Iraq’s WMD in mind he did express caution about rushing to a conclusion about Syria’s use of chemical weapons. Mr. Obama’s comments at a news conference Tuesday made clear that he wasn’t poised to act unilaterally and suggested he would look for an international consensus in deciding whether President Bashar al-Assad’s regime used chemical weapons before committing military forces. In doing so, Mr. Obama made the prospects of a military response more remote. Meanwhile, top White House and North Atlantic Treaty Organization officials say there is little appetite in the alliance for military intervention in Syria. He also noted that only ten percent of the Syrian opposition casualties have occurred through the Assad regime’s use of air power, raising the question of how much a no-fly zone would accomplish. Perhaps—and let’s be Pollyannaish here—Obama is letting it be known that he’s considering arming the rebels and taking other aggressive actions in order to convince Putin, and Russia, that the United States is serious about Syria. If so, that can’t be the right strategy. Real, serious diplomacy, with the UN’s Lakhdar Brahimi at its center, is the right focus. For more on Syria, read Robert Dreyfuss on Congressional Republicans’ siren song for intervention.